We are very excited to be holding our first street dance fitness course for Street Fit® on the 16th January 2012 at Expressions Studio in London. The course is getting booked up fast so we urge you to book as soon as possible; as an introductory offer and to celebrate the launch we are offering you FREE Street Fit® Training Wear if you book by the 16th of December 2011. Workout in style in your very own exclusive T-Shirt, Hooded Sweat and Joggers worth £60. So what are you waiting for? 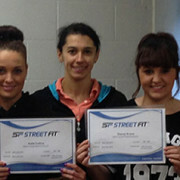 Start your new future today and become a Street Fit Instructor. Be sure to check out our videos which you can view on facebook or on our dance fitness youtube channel to give you more of an idea about what Street Fit can offer you.